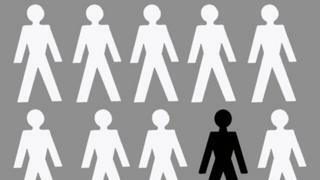 Racism in Wales is under-reported, according to a study by a race watchdog. Race Council Cymru said many black and minority ethnic people are resigned to accepting racism and change their own behaviour to try to deal with it. Language barriers, fear of reprisals and a lack of trust in the police were all reasons given for not speaking out, the report found. Around 4% of Wales' 3m population is from an ethnic minority background. The study interviewed 350 people representing a range of black and minority ethnic (BME) communities. I got told once 'it's stopped raining outside, you can take your tea-towel of your head now.' It's silly things like that, it's really saddening. It is saddening when you hear your family suffering such things as well. We adapt our behaviour in that we may avoid walking down the street in the evening or the late afternoon. If they were going in to the centre of town they may dress differently, a little bit more westernised so that they're accepted and avoid the racist remarks and abuse, the everyday abuse that we get. It concluded that there is evidence that racism is often subtly reinforced by people's perceptions, but that verbal and physical abuse also still occurs. The report's author, Prof Heaven Crawley, director of the Centre for Migration Policy Research at Swansea University, people had described the abuse the suffer as "every day racism". She said: "It's things that happen when people get on a bus, they have verbal abuse hurled at them, they may be walking down the street and people are shouting things out of vans as they walk along. "They don't use public transport. They cover up their skin. "Many young women in particular are choosing not to hear the hijab [head scarf] because that specifically targets them for racist abuse from passing people." Pro Crawley said Wales had seen "significant improvements" when compared to the experiences of black and ethnic minority people in the 1960 and 1970s. But a "a negative public debate about migration" had accompanied increased migration to Wales over the past 15 years and an increase in poverty and social exclusion in some areas, she said. "Those factors have combined to really make some of this behaviour almost acceptable and not challenged, not just by people from BME background themselves, but the rest of us who sit by and watch this happen." The race council's chair, Ray Singh, told BBC Radio Wales it was important that all public sector agencies, including the Welsh government, police and crime commissioners and schools challenge racism. He said: "Black and ethnic minority leaders also have a lot of responsibility in promoting a cohesive society in Wales."